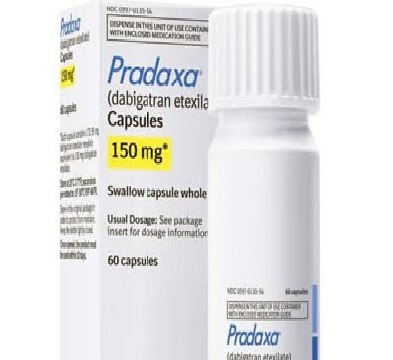 Pradaxa (dabigatran etexilate mesylate) is an anticoagulant (or, blood-thinner). It is prescribed for patients with atrial fibrillation (irregular heartbeat) that is unrelated to a heart valve problem in order to reduce the risk of blood clots and stroke. Pradaxa works by helping to prevent the formation of blood clots which, in turn, lowers the risk of stroke. Patients with atrial fibrillation are at higher risk for clots because irregular heartbeat can mean less regular blood flow and the possibility of blood pooling and settling in the heart’s chambers (atria) where it can form into a clot. If the clot breaks loose and subsequently causes a blockage in one of the arteries in the vein, an ischematic stroke, in which the clot cuts off blood flow to the brain, can result. Pradaxa is one of a class of medications called direct thrombin inhibitors which attach themselves to thrombin, a clotting agent in the blood, and reduces its ability to form a clot. It is taken orally. Pradaxa is produced by the German-based manufacturer Boehringer Ingelheim. It was introduced into the U.S. market in October of 2010 after it was approved by the FDA. Pradaxa quickly emerged as a competitive alternative to another blood thinner, Coumadin (warfarin), produced by Bristol-Myers Squibb, which had long been the most popular and widely prescribed drug for the prevention of blood clots and stroke. Pradaxa was popular because it had a major advantage over Coumadin: it did not require regular blood testing and was therefore much more convenient to use for both doctors and patients. In-house researchers at Boehringer Ingelheim also found that it prevented strokes more effectively. Additionally, people who use Pradaxa may experience allergic reactions to the drug. More serious Pradaxa side effects have also been reported and/or studied. Any of the following symptoms may indicate one of the dangerous and potentially fatal bleeding side effects (gastrointestinal and intracranial hemorrhage, or “bleed out deaths”) associated with Pradaxa. Patients having one or more of these symptoms should seek prompt medical attention. Although all blood thinners carry some bleeding risks, Pradaxa is particularly problematic in that there is no approved antidote for the drug’s bleeding side effects. Although some remedies (such as vitamin K) are available for other drugs like Coumadin, some doctors report being helpless as a patient hemorrhaged to death with no reversal agent available. Recently, research scientists from Boehringer Ingelheim published and presented studies about a possible antidote, known as aDabi-Fab, which has been tested with favorable results on rats and pigs. However, no known antidote has been available in the previous three years that the drug has been available, and the potential antidote presented by researchers has not been approved or made available. Pradaxa has been associated with unusually high numbers of serious bleeding incidents or fatalities in some studies. In data reported to the FDA in 2011, the year after Pradaxa’s approval, 542 fatalities were associated with the drug. To date, as many as 1000 Pradaxa-related deaths have been reported. Data collected by the FDA in 2012, and analyzed in a study by the Institute for Safe Medication Practices, shows Pradaxa implicated in patient death at five times the rate of Coumadin, its leading competitor. A study published in the Journal of the American College of Cardiology suggest significant bleeding and heart attack risks for Pradaxa compared to Coumedin. Data collected in the Randomized Evaluation of Longterm Anticoagulant Therapy (RE-LY) trial associated with the drug’s manufacturer found increased risks of heart attack. Doctors from the Cleveland Clinic, Ken Uchino and Adrian Hernandez, also found in their own analysis that heart attack and other heart risks were higher for Pradaxa than Coumadin. Boehringer Ingelheim has disputed claims about the drug’s relative lack of safety, noting a lack of contextualization for the studies, and the possible underreporting of incidents associated with Coumedin. They point to the FDA’s continuing approval of the drug as safe and effective. The FDA maintained in a report at the end of 2012 that bleeding risks associated with Pradaxa were not greater than those associated with Coumedin. The FDA did issue a safety communication in December of 2012 that patients with mechanical heart valves should not take Pradaxa in response to a clinical trial in Europe, R-ALIGN, which indicated high rates of blood clots, stroke, and heart attack for patients with heart valves who had been prescribed the drug. By the end of 2013, however, they announced a new study to reevaluate Pradaxa bleeding and heart attack risks. A “request for comment” was posted on their website on December 2013, in which they announced the study to compare new users of both Pradaxa and Coumedin to evaluate their relative rates of serious bleeding problems and heart attack. A Boehringer Ingelheim spokesmen has indicated that some bleeding problems associated with the drug may be related to a lack of care in the prescription of the drug to those with kidney problems or elevated age, rather than the overall danger of Pradaxa itself. Pradaxa lawsuits hinge on allegations that the company failed to warn patients and doctors about the lack of a bleeding antidote for the drug. In May of 2014, Boehringer Ingelheim announced a $650 million Pradaxa settlement to cover an estimated 4,000 lawsuits filed over bleeding injuries. The total payout averages out to around $160,000 per plaintiff. Boehringer did not concede liability in these cases, and continues to assert that Pradaxa is not defective and does not pose unusual risk to patients. The majority of lawsuits have been consolidated as part of a multidistrict litigation (or MDL) under Judge David Herndon in East St. Louis, Illinois. The lawsuits in an MDL are adjudicated separately, but are centralized under one judge, in one court, for the purpose of efficient pre-trial discovery. Bellwether cases, representative lawsuits from the MDL that will set the tone for future trials, are scheduled for September of 2014 and March of 2015. Boehringer Ingelheim has already been fined $931,000 by Judge Herndon for destroying documents related to the drugs marketing and development. Internal e-mails that have come to light during the discovery phase of the trials indicate the company’s unease at the suggestion that more frequent blood testing might be necessary for Pradaxa, a factor that would undercut the drug’s competitive edge over Coumedin and other brands of warfarin. For more information regarding the litigation, speak to a Pradaxa lawyer who can provide information about the latest developments, and whether your case may qualify for representation.